It's the 25th edition of Camera-Critters!!! As you'll see, obviously some of us are a little more excited than others. I don't see a calf... does anyone see a calf? You brought it on yourself!" Looks very comfy! We don't have a lot of cows in my 'hood! Ha! Are you a cow whisperer? I bet you are just a animal bug any kind of critter whisperer right? Its so cute. Those sad, dark eyes. Calves I've tried to photograph always run off. You must have a knack! there's that infamous calf again! what a cutie. don't you wish they stay young forever though? she's your little baby! 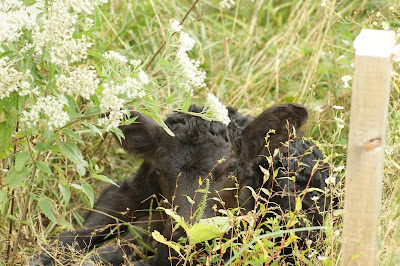 Of course calves can hide behind a blade of grass - and I've known mothers do do the same. Usually when you are worried about them. Please stop by both blogs for double the CC !! Cute calf, still with his curly hair. Great dialog you two had! Stop by if you have a moment. 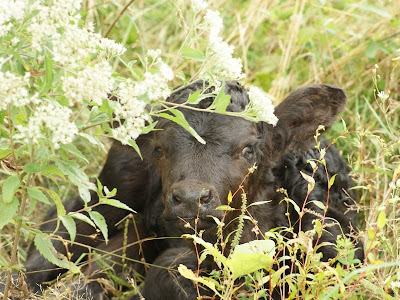 Love your calf hiding in the tall grass. I’ve got Ms. Kitty hiding similarly in the Baby Tears throughout my yard. Those eyes say a lot, even in human speak 8v) Funny set. Such a cute cow playing peek-a-boo. Aw, where was it's Mama? Cute photos! 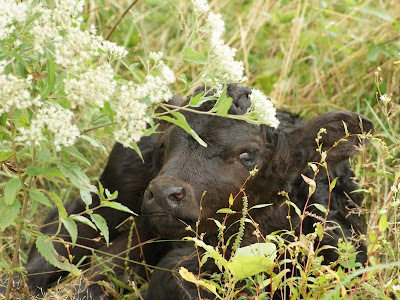 Looks like the calf appreciates lovely flowers. 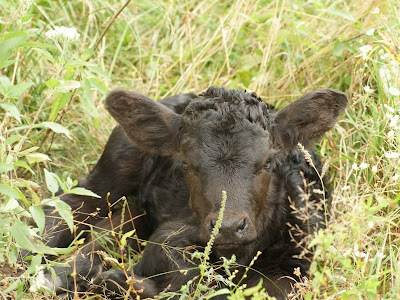 This calf is a source of photo inspiration, and cute :-) Congrats with the 25th camera critters ! Misty: How can an animal that big think it's hiding in those low weeds. It did give you the move on look for certain. That baby is precious! Happy 25th CC! Wonderful - love the commentary. I did one this week too. Great shots. Good thing you weren't cowed down! How can you make a cow look so cute! Such a little cutie! Did you name her yet. Great post Misty! They are cute aren't they? Nice set of pictures of a cute animal. P.S. Love your SWF picture too! Awwww...I just want to hug him and love him and squeeze him...! Those calf shots are great! I love the calf trying to hide in the grass. Too cute. Wonderful shots of the little guy peeking through. Love the story and cow talk!! The photos are great!! Take Care!! Heh...that calf is looking at you in a not-nice tone of voice. Congrats on your 25th! The calf is so cute and looks so innocent and sweet! You have such a way with all animals, my hats off to you! I have not posted yet, it's been one of those weeks lately. I do love your CC meme!! Love those fuzzy ears, dark curls, and long eyelashes.